Coming up soon is St. Patrick's Day. One of the iconic veggies in Irish history is the potato. Known for both famine and feast, the potato plays a central role in Irish foods. You may wonder why. Irish weather is wet and cold. Their growing season not so long. Root crops play an important role in survival in climates such as these. Potatoes are a nutrient dense, hardy, and shelf stable crop, important for peasant farmers. The potato famine struck Ireland between the years of 1845-9, when the potato crop was damaged by blight over the 4 years, a fungus that also impacts tomatoes. Damage to such a staple, wiped out food reserves for the poor of Ireland, and led to 1 million people dying of starvation, with more who emigrated to nations like the United States.Today we find many traditional Irish dishes still honor the potato. Potato bread, Shepard's Pie with it's potato crust, Potato Leek Soup, Boxty (a potato pancake), Colcannon (a mashed potato dish with cabbage), and Irish Stew.Root veggies in colder climates have always been staples to last throughout the winter and early spring, before fresh spring greens and shoots arrive. We're finishing up the last of our root veggies, appropriately from our CSA farm called the Root Down Farm! Their potatoes are like none other. However, if you have other root veggies on hand, they can usually be swapped out for potatoes in many dishes. For example, celeriac is the root of the celery plant, and provides a sweet, yet starchy component to dishes. Like all root veggies, the starch stored in the root converts to sugar once heated, and broken down it becomes creamy. 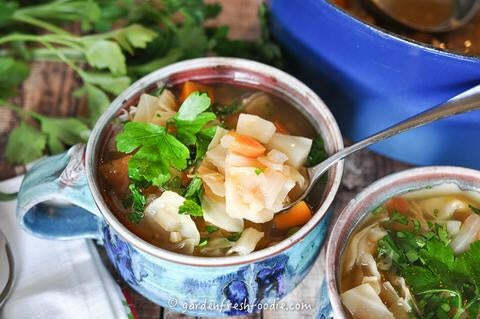 I love combining a variety of root veggies into a soup. Celeriac, parsnips, carrots, and potatoes all blend beautifully together. Their addition with the allium root family-onions and garlic, blend wonderfully for a hardy celebration of winter's end. Any who doesn't want to celebrate that? !My recent soup creation was inspired by the use of my root veggies. 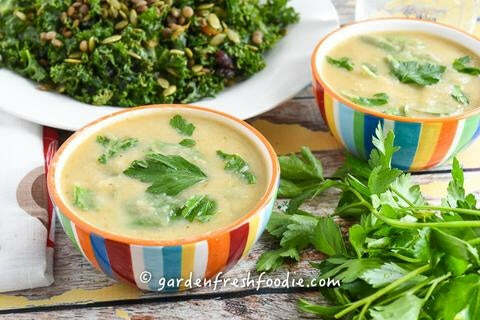 The soup below combines nutrient dense beans and greens, with the creamy goodness of root veggies. While, not made with your traditional potato, this recipe is a great alternative to potato leek soup! Try these root inspired dishes for your celebrations in the month of March! There's St. Patty's Day and Easter in there-so try out a bunch!